Bob Bradley of the Alabama Department of Archives & History accepts a $1,250 donation to the “Flag Conservation Fund” to support ongoing conservation from Nelson Andrews, Commander of SCV’s Christopher C. Peagues Camp and a member of the Battle of Selma Re-enactment Committee, from the April 1865 Society, Inc. sponsoring entity of the Event. 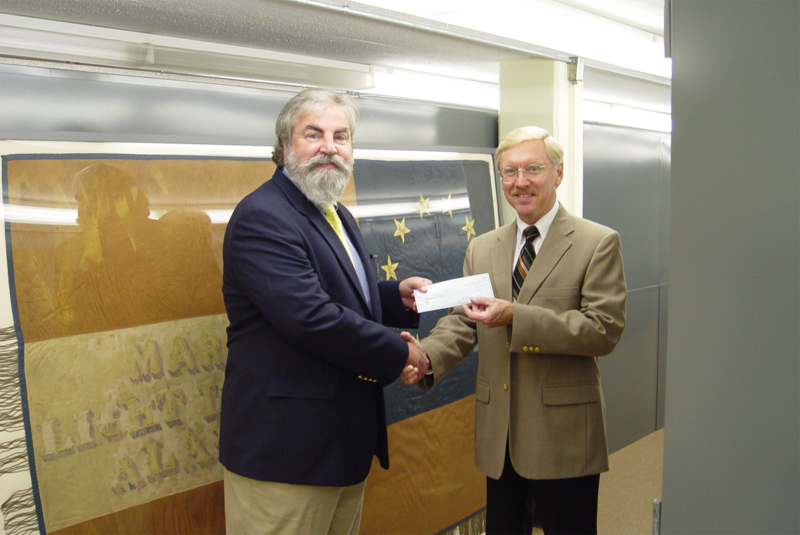 The ADAH holds one of the largest Civil War flag collections in the U.S.
Bob Bradley of the Alabama Department of Archives & History accepts a $1,000 donation to the “Flag Conservation Fund” to support ongoing conservation from Colonel Percy Blackmon, Ret., Board Member of the April 1865 Society, Inc. sponsoring entity of the Battle of Selma Re-enactment. The ADAH holds one of the largest Civil War flag collections in the U.S.
Bob Bradley of the Alabama Department of Archives & History accepts a $1,250 donation to the “Flag Conservation Fund” to support ongoing conservation from Frank Brower, Board Member of the April 1865 Society, Inc. sponsoring entity of the Battle of Selma Re-enactment. 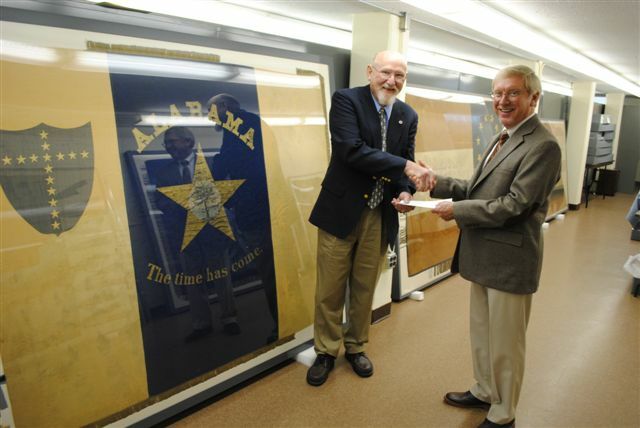 The ADAH holds one of the largest Civil War flag collections in the U.S.
Bob Bradley of the Alabama Department of Archives & History accepts a one thousand dollar donation to the “Flag Conservation Fund” to support ongoing conservation from James H. Hammonds, President of the 1865 Society, Inc. sponsoring entity of the Battle of Selma Re-enactment. The ADAH holds one of the largest Civil War flag collections in the U.S. “Our thanks go to the entire April 1865 Society for investing in the preservation of these storied banners. Your foresight will be to the benefit of future generations” said Steve Murray Assistant Director, Alabama Department of Archives & History.